Trophy is my favorite local Seattle cupcake shop, so you can imagine how thrilled I was when Jennifer Shea released a cupcake book! It's full of party ideas, party planning tips, and signature cupcake recipes. There are over 130 types of candies and chocolates at Sugarfina! They have a lot of pretty gift collections and an entire $25 and under section. This one's on my wish list! Dottie's Diner has a nice selection of gorgeous aprons. These little bears are also on my own wish list - so cute and delicious! These cherry kiss cookies are perfect for the holidays. How cute is this chocolate throne? These gourmet cookies make my mouth water! The Cravory has prepaid subscriptions available in various amounts and lengths. Your gift recipient can show off their love of dessert with this heart-shaped ice cream ring (from my shop)! Know someone who likes cupcakes but prefers badass over cutesy? This crewneck is perfect. My boyfriend and I both have some Johnny Cupcakes apparel and love them. Esther Aguirre makes the most amazing chocolate! I've ordered many times and the mint chocolate bark is one of my consistent favorites. Guaranteed to make any sweet tooth grin like a madman. Like Trophy Cupcakes, this is a recipe book from another Seattle shop owner! I got this book a while back for my friend, Carolyn, who (unlike me) is not too lazy to make her own ice cream. She and her fiancee have tried most of the recipes in the book and given them rave reviews. 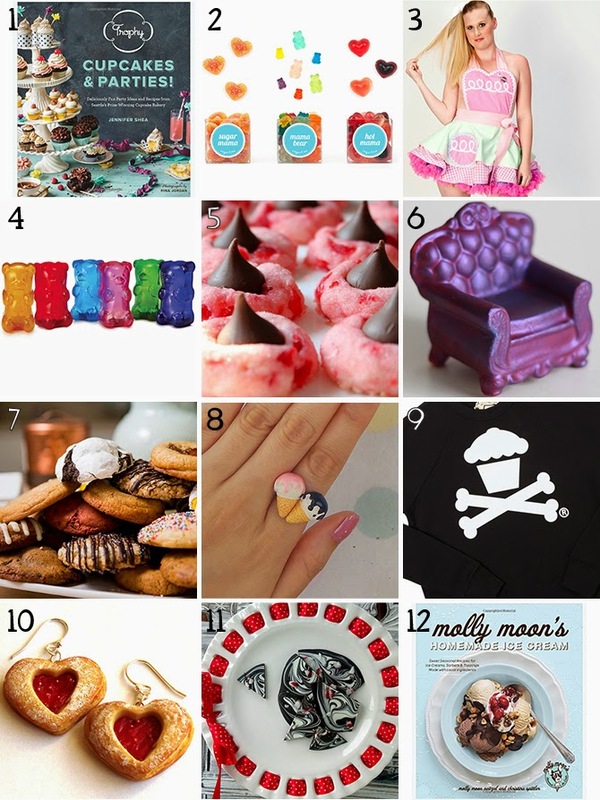 I have such a sweet tooth, I want everything on this list! The purple chocolate throne is especially amazing. And I've been meaning to get a Johnny Cupcakes shirt forever. Ahh I know - that throne just amazes me! I have the cupcake bomber shirt in grey from Johnny Cupcakes and love it! All the baked goods look so delicious and I really wish we had more food delivery stuff in Aus, I'm quite envious. I'm jealous that you guys have Nectar and Stone (http://nectarandstonemelbourne.com/)!! So much sweetness and cuteness here! Yeah compiling this gift guide made me hungry... hehe. Oooh I love this! The heart shaped ice cream ring is so cute!! My favorite is your ice cream ring... it's very cute! Aww, thanks, Crissy! <3 <3 It's one of my faves too!